Learn more about living gluten free by visiting Udi’s Community page or following them on Facebook! « . what i ate [today] . Er yum- love the addition of grated carrot & walnuts to this, Amanda! These remind me of the morning glory muffins I used to be obsessed with at Starbucks…chances are they didn’t have as awesome ingredients or nutritional info as your recipe though ;)! I always feel like I’m 80 when I admit that I way prefer muffins over cupcakes- I personally think the latter are so overrated and there’s just too much frosting going on! I totally hear ya on that one, girl! The older I get, the more my sweet tooth seems to calm down, and I find myself actually preferring heartier muffins over super sweet cupcakes. I think I could eat all the ingredients separately right now and be happy 🙂 I’m also a fan of a denser muffin so that almond butter is looking fab to me! I guess I just like to feel like I’m eating something filling no matter what it is. I think muffins are my favorite type of baked good thing, too – it must be a texture thing. These look great! These look and sound fabulous! I think I’d like that texture… it’s pinned! Loving the way you think, girl! 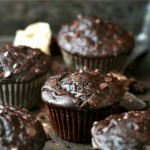 I LOVE muffins as well – many of my own creations fall into that category! I’ve recently started experimenting with “cuppins” aka muffin-cupcake hybrids which I have to say are also delicious. Since I’m GF and tree-nut-free I work around those restrictions, thanks so much for including substitution notes with your recipes! Cuppins?! I’m intrigued! I honestly have no idea what the difference is between a muffin and a cupcake besides the frosting, so I wouldn’t even know where to begin on experimenting with that! I guess to me, the main difference is cupcakes are lighter whereas muffins are denser, and I usually make muffins with oats or oat flour but cupcakes with other GF flours (I’ve had great success with sorghum flour cupcakes!) So I basically split the difference between the two bases, and also use a combination of yogurt and milk that makes it a very moderate sort of crumbly. Genius! I’ve actually never used sorghum flour in baking before, so I’m curious to see what the texture would be like! Yum! I just made some carrot muffins this weekend, and the family LOVED them. Kevin and I had a hard time holding ourselves back since they were supposed to be for Ethan. haha I think I’ll have to make some more this weekend. So what exactly constitutes as “morning glory?” Asking for a friend… 😉 Is it the inclusion of carrots, walnuts, etc? Wow that just made me even happier! I have multiple food allergies, and my Dr suggested yesterday that I try an anti inflammatory diet… basically fruits, vegetables, fatty fish, and chicken… so, finding this recipe made me happy! I had already thought pineapple would be nice, coconut hadn’t crossed my mind…. and maybe i could switch sunflower kernels for walnuts… not a fan… oh or pistachios…. yum….. so yummy. My mom actually made a lot of morning glory muffins when we were younger. I liked them a lot and now I’m craving one. Wow I like several of your readers as well, haven’t had a good muffin in awhile. I think I need to try this! Going to pin so I’ll have it! Thanks! these look and sound great. 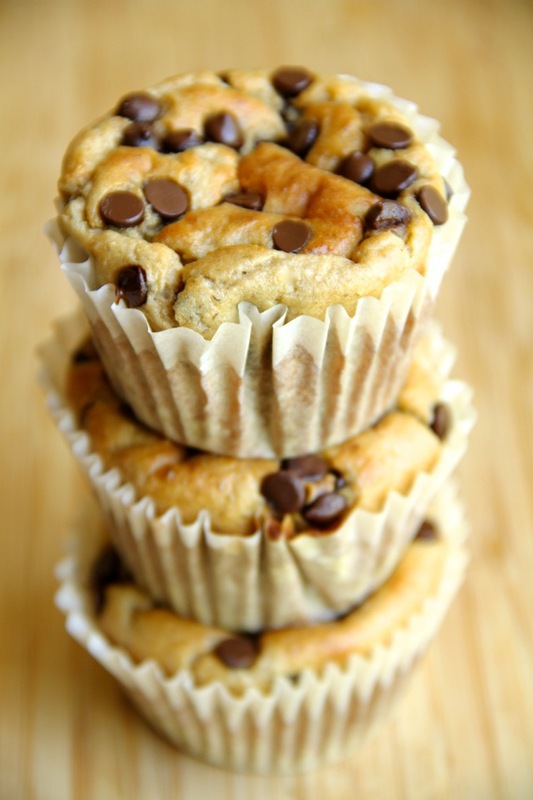 love morning glory muffins. will definitely give them a try. This wasn’t very cool It seems as though you are playing a very bad game of copy-cat…after all, it seems as though you copied Leigha’s muffins she just recently posted on 3/8 here: http://theyoopergirl.com/2015/03/vegan-morning-glory-muffins/ If so, you may wish to apologize to her. As well, I know this isn’t the first time, Amanda, that you’ve ripped stuff off of other people’s ideas/posts. Morning Glory muffins are actually an extremely popular type of muffin, DD, especially for the spring time. I try to do a flourless muffin recipe every month or two, and that was my flavour choice for March. In fact, this post has been scheduled in my editorial calendar for a while now, so we must just be riding the same wavelength. amanda, you did such a great job responding even-handedly to this flame. i was curious and looked at the other recipe–not similar at all!! not gluten free! some folks just have to go looking for trouble. life is too short. really like this recipe–didn’t have an apple so added more carrot and raisins; it could have been a tad sweeter and probably would have been with the apple. weekday morning breakfast has become more interesting! you have got to be kidding !!! right? you are so rude ! it is not that much alike !!! Mmmm, morning glory muffins are my KRYPTONITE. So freaking delicious. But they generally tend to be the size of my head, and result in a massive sugar / high crash which is not actually that fun. These look like exactly what I need in my life! I LOVE muffins and morning glory’s are definitely a favorite of mine…I especially like really big muffins that are crispy around the edges…Nom Nom! Oh, these might be my favorite of all your muffins. 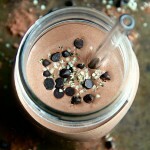 I’m obsessed with the flavors and of course, the ingredient list is wholesome and perfect! Pinned! 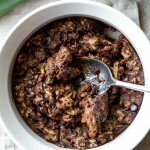 My go to gluten-free dish would have to be quinoa casserole. I love how nutritious it is! I LOVE muffins because they are such a great grab-and-go option in the morning. I like making them from scratch, though, because I find the nutritional integrity of store-bought muffins to resemble a cake rather than a nutritious breakfast option. Those look awesome as usual. I have a muffin pan that I think I only used once bc I was trying to be super healthy and used only whole wheat flour. They turned into super dense and dry muffins and I never looked back at making them again. I need to start doing so bc I always love muffins! Oh I can definitely relate to that! Whole wheat can be a tricky to work with, which is why I love the flourless kind — they’re crazy soft and tender! Muffins definitely hold a special place in my heart as well. Portable, portioned, and delicious! Not much can beat that! I also adore your idea of mixing them in a blender. SO EASY. These look SO good. My mom and I refer to sweets which are TOO sweet as giving us, “sugar mouth”. It’s so sweet it lingers in your mouth and UGH, I just can’t do it anymore. I’d rather have some rich dark chocolate or a homemade baked good! That’s the -perfect- way to describe it! I used to boast about nothing being too sweet for me when I was a kid, but I feel like the older I get, the less tolerance I have for really sweet foods… especially if they’re really rich at the same time. These look AWESOME! And I love that they pack a nutritional punch too. Pinning and can’t wait to make these for Hunter and me! I think he’d love them! They look amazing! And very hearty! I’ve been loving muffins lately. I made some this morning and it was the most magical time. I don’t know what the definition of “morning glory” is, but I do know that I’ve loved every muffin with this name that I’ve tried. These look so good too! I do love a good muffin but I think my favourite thing to make/eat are granola or energy bars of some kind. I love how hearty and satisfying they are. I -think- it’s a muffin with apples, carrots, walnuts, raisins, coconut, and pineapple… or some odd mixture of those 😆 And granola is seriously my kryptonite. I can’t control myself around it. I’m digging all the healthy and delicious ingredients inside these bad boys. Apples, carrots, walnuts, ginger. There is so much nutritional goodness; I love it. Also, I’ve had Kraft Mac & Cheese as an adult (or as much as I can be); it’s not the same. Kinda icky. Homemade on the other hand….different and better story. I just ordered a blendtec through Airmiles. I am definitely making these once I get it! LOVE THESE! 🙂 I haven’t been here in a while but just wanted to say hi! Hope you are well. 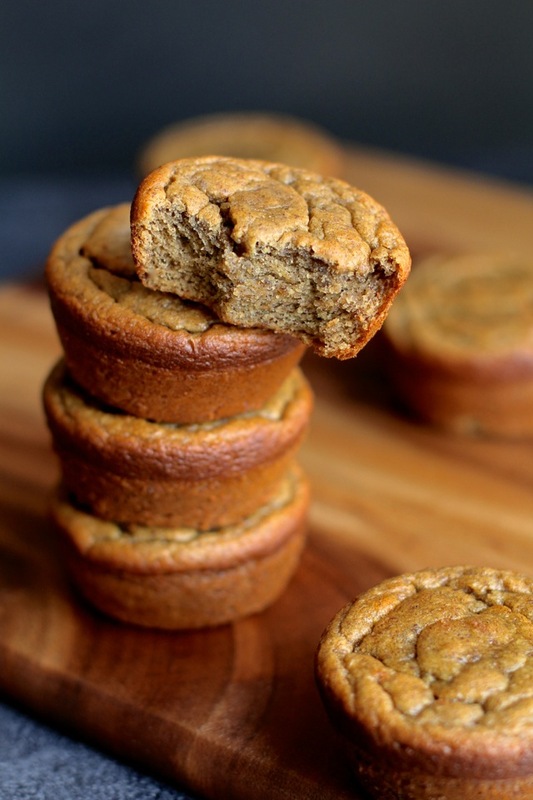 I’ve been looking for a healthy breakfast muffin recipe that I can whip up for the whole family and definitely have found it here with this recipe. 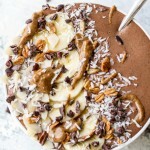 I love the nut butter addition! Is it possible to sub nut butter with coconut oil? The only nut butter I have is peanut butter and I’d rather not add it because the flavor might be too strong. I just made morning glory muffins from The Yooper Girl a few days ago, but now I want these too!! Muffins are probably my favorite baked good too, come to think of it. Mostly because they’re the perfect vehicle for nut butter, but…for all your reasons too. 😉 I am so craving that doughy, flourless texture right now ahh! I tried making these today and they turned out horrible. I was so excited to make these but for some reason they just did like work for me. I baked them for a longer time because they were still moist in the middle. No matter how l baked them for they were still wet in the middle. I had such high hopes for these. I also made these for the first time, and I also had the same problem where they were still moist in the middle. No matter how long I left them in the oven (without burning them) they just wouldn’t cook in the middle. The middle was wet and mushy. Loved the flavor but didn’t like the middle, any suggestions for getting them to cook in the middle, as I would like to try them again ! the heck can that be? I use sun butter instead of almond. could that be it? I make my own by soaking the seeds, the roasting and grinding. Help!! That’s definitely it, Mary! Sunflower seeds contain chlorophyll, which reacts with the baking soda when it’s heated. As it cools, it turns green. This isn’t harmful in any way, and the muffins are still perfectly safe to eat. Love the idea of this recipe, but when I made it my muffins did not set in the middle. I even tried increasing the baking time (by alot!) and for some reason, they are still not setting and are too gooey in the middle. I love the idea of having a tasty and healthy breakfast like this! Thanks for the recipe! These will definitely be a staple in my home. The only thing I changed was omitting the raisins and adding a bit less honey as I do not like overly sweet baked goods. I also baked them for about 6-7 mins longer. Perfect! Probably the best muffins I’ve ever baked… Thanks for this wonderful recipe. These are delicious but did not stick together for me. Is cooking them longer the answer, or adding more oats, or some almond or brown rice flour? I’d love to try these but I’m allergic to bananas. Is there a substitute for it? You could actually try subbing in another egg, Allyson! But you might want to increase the honey by a few tablespoons as well to make up for the lack of sweetness from the banana. Oooh, so good to know! I’m allergic to bananas, too, but never knew what an appropriate substitute might be. (I was toying with the idea of pumpkin puree?? Would have probably been a disgusting mess!) Thanks, ladies. DO U KNOW THE NUTRITION INFO? I make muffins 1-2 times weekly. These unfortunately sound delicious but are not tried tested and true. I followed your recipe perfectly, and they came out completely undercooked. I tried to cook them for longer (with loose foil overtop to prevent burning), and they still wouldn’t cook. You can’t simply take a recipe, exclude the flour and expect it to turn out. I should have known! I have just made these for a Dear Gluten Free girlfriend and of course had to try one….totally yummy…MANY THANKS FOR THE WONDERFUL RECIPE! I’m so glad you enjoyed it, Daphne! 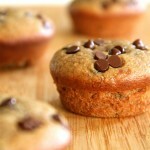 These muffins are pretty darn good, especially with some butter or nut butter slathered on top. I think next time I will add a little more spice though. And…how are these for diabetics? Would very much like to have the nutritional info (carbs and sugars) in particular for these muffins. Thanks. You can figure that out quite easily by yourself by plugging the ingredients into a recipe builder! I use MyFitnessPal. Tried these this morning and they were delicious! Thank you! 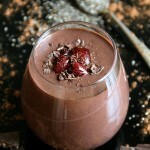 Do you have the nutrition facts for this recipe? All the ingredients meshed well together and the flavor was really good. The only thing I had an issue with was the cooking time. I baked mine in a 375 F preheated oven, for 15 minutes as stated in the recipe but they were still raw on the inside. I also had 10 muffins, and the cake liners were almost past the 3/4 fill mark.. what did I do wrong?! I definitely want to make these again but need to get this cooking time precise! Please help, thank you! Hi Kaitlyn! I would try them for about 20-22 minutes, in that case. You could always use a toothpick to see how they’re doing on the inside. Obsessed with these muffins! Made them many, many times. Have you ever tried baking it as a loaf instead of as muffins? Curious if the recipe or bake time would need to be adjusted. Any thoughts? Thanks so much! What is the nutritional breakdown of this? total carbs? Total fat & protein? I’m fearful as delicious as these sound they may be too high carb for me. These muffins are delicious!! I bought a bag of oatmeal at Trader Joe’s and keep trying to like overnight oats, but, I’m just not a fan. I was trying to find another use for the oatmeal and this is perfect! 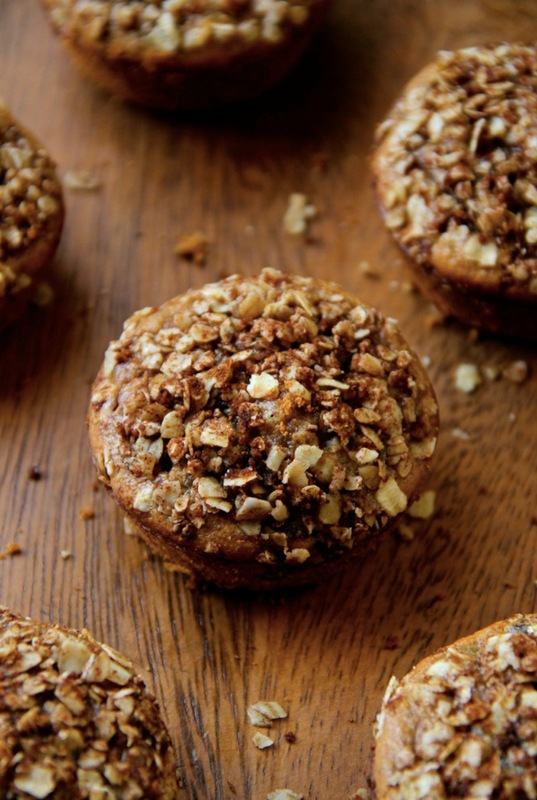 And, you have all of those other healthy ingredients in these muffins too! Just perfect – thank you! I just made these with pecans and they are delicious! Perfectly sweet with great flavor. The carrots and apples make them moist. I cooked for 20 minutes. Thanks for the recipe. I’m so glad you like them, Joanna! Thanks so much for taking the time to leave a comment and let me know! Is there nutrition facts ? Can I make these as mini-muffins and if so, what would the cook time be? I assume these are full-size muffins? Can I make these as mini-muffins and if so, what would the adjusted cook time be? Love these! Thank you for the lovely recipe. Just made these. They came out really wet in the middle almost like they weren’t cooked . I put them in the oven a little bit longer and they were still wet. I baked them for 30 Min total. The flavor was great but I think next time I will add more oats. I’m high altitude so I’m guessing that’s the reason they were mushy and didn’t really rise. I followed the recipes to the T so I don’t know what else would cause them to turn out the way they did. Definitely going to retry and let you know if it did the trick! Just made these and they are great..,except mine turned green after awhile in the air…what in the world?? They will turn green if you use sunbutter. It’s still safe to eat, just a natural chemical reaction. How could I make them oat free? Any substitution ideas??? thanks in advance! Thanks for sharing! I love that they are so healthy! It’s amazing that they rise so well with just those ingredients. Next time I will have to double the recipie. As it only made 9 muffins. My muffins did not look like yours. They took 20 min to cook. Maybe my stove, maybe my altitude??? Trying one now; a little gummy, I think next time I will add a little oat flour. Oops silly me, now I read the recipie is good for 9. Next time I will make monk’s maybe they will cook better. Not trying to be neg. Here actually I am writing this for me, to remember what I need to do next time. I made a double batch of these and absolutely LOVE them!!! So much flavor and the consistency is awesome! Will absolutely be making these again thank you so much for the recipe! Also wondering if you know nutritional value (calories, protein, fiber, etc,). Thanks again! I came across this recipe on Pinterest. I was on a hunt for a healthy muffin that I could have in hand for late night breastfeeding sessions. I made them today, and they’re perfect. I baked them much longer than the recipe says, but they worked out well!